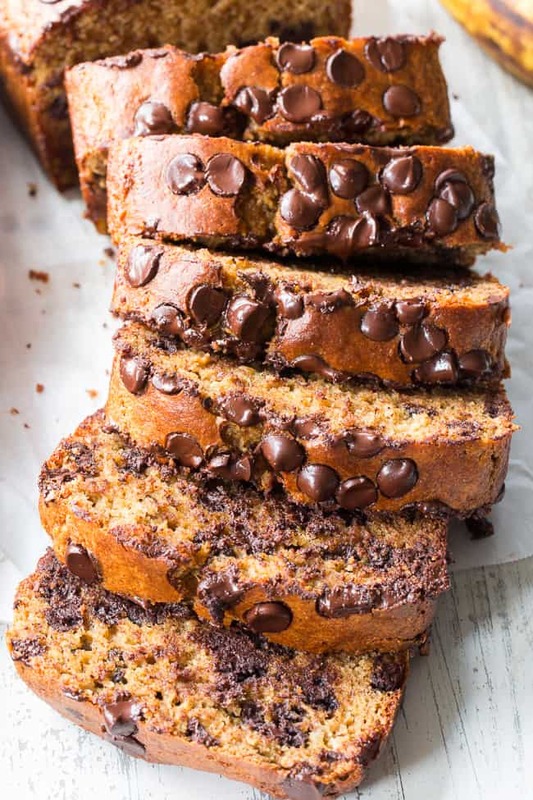 This Paleo chocolate chip banana bread is made with almond butter and almond flour, hearty and delicious with the perfect amount of sweetness. Gluten-free, dairy-free, grain free, family approved, and great for breakfast or dessert! 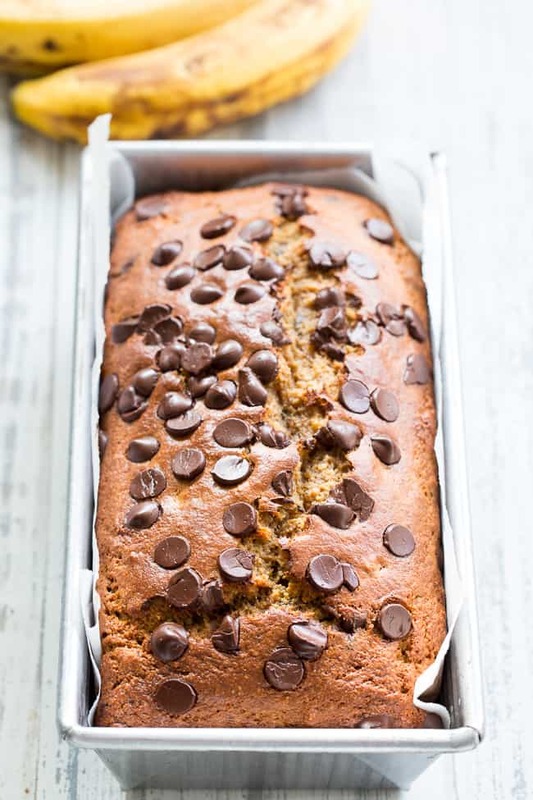 This is a remake of my old favorite banana bread recipe – the one that NEVER disappoints. 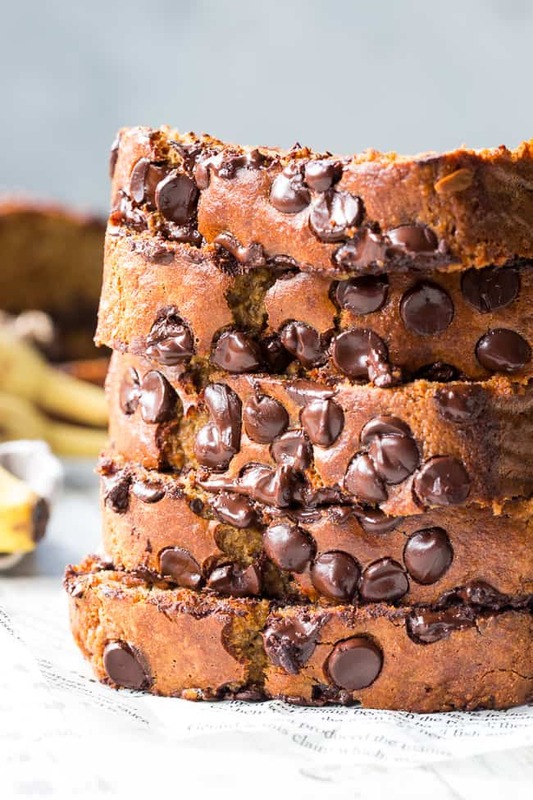 Yes, it’s definitely a dessert-y banana bread with all the almond butter and dark chocolate it’s loaded with – but I make no apologies for that. And you won’t either, once you make it and taste it for yourself! One of the best things about banana bread is how versatile it is, after all. 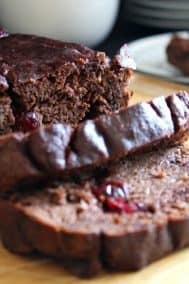 From breakfast and snacks (like my no-sugar-added banana bread) to full on dessert (like my nut-free double chocolate banana bread), it can be whatever you need it to be for the moment. Banana bread is sort of my baking “happy place” for a couple of reasons. First – banana bread is typically really easy to make – like, do it with my eyes closed easy – if you know what I mean. 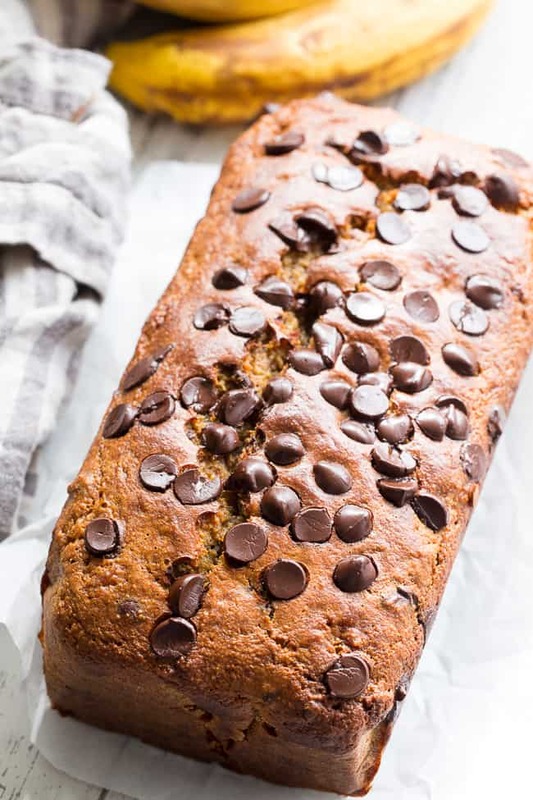 No need to double check measurements and order of operations every step for banana bread – it’s almost fool-proof. Which, brings me to reason number two it’s what happiness is made of – it’s forgiving as heck. Ease and forgiveness in baking is HAPPY baking, for sure. Have you ever forgotten if you’ve added an ingredient and can’t figure it out by looking at the batter? Yup, this is a weekly occurrence for me, and let me tell you – it’s not a good feeling! But with banana bread? Somehow it always comes out right. Or, at least edible. It comes out edible even if you mis-measure, or leave an ingredient out entirely. Well, perhaps except for the bananas. I’m crediting the bananas for all this happiness anyway. 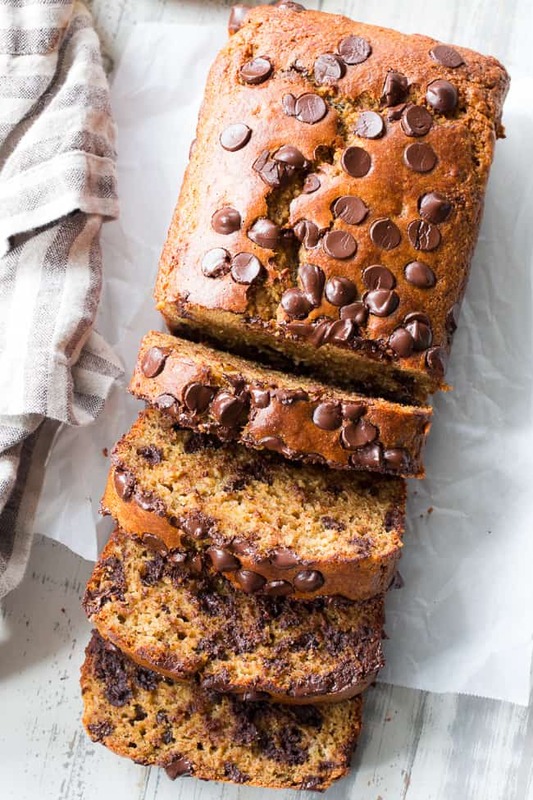 So, to get a bit more specific about this dreamy chocolate chip banana bread you’ll be making today, the “secret” ingredient is almond butter. I mean, it’s not exactly a secret (it’s in the title, after all) but I do give it a whole lot of credit for both the incredible flavor and texture of the bread. Rather than weigh it down, the almond butter gives the bread a moist yet fluffy quality, and 100% helps with the rise of the bread (good rise = happy baker, too). It also gives it a rich nutty flavor that complements the dark chocolate oh so well! As for the chocolate, if you don’t need the bread to be strictly paleo, you can use dairy free, soy free dark chocolate chips such as Enjoy Life dark chocolate morsels. If you want to avoid added sugar, you can also use a paleo friendly dark chocolate bar, chopped up, OR make your own homemade chocolate chunks. If you decide to make your own, you can use the chocolate recipe from my cookie dough truffles – simply allowing the chocolate mixture to chill in a parchment lined loaf pan before chopping and adding to the batter. 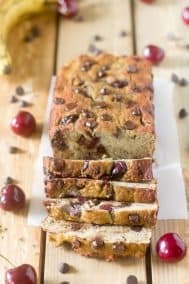 Whichever option you go with, you’ll be left with the BEST dessert-y paleo chocolate chip banana bread you could imagine. Are you all ready to bake?! Let’s go! In a large bowl, combine the bananas, eggs, almond butter, coconut sugar and vanilla and whisk until smooth. In a separate bowl, combine with almond flour, tapioca flour, baking powder, baking soda and salt. 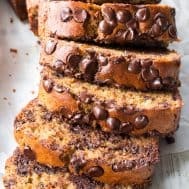 Gently stir the dry mixture into the wet ingredients until just combined (don’t overmix) then fold in the chocolate chips, leaving a few to sprinkle over the top of the loaf. Transfer to the prepared loaf pan, scraping the bowl with a spatula, spread out and sprinkle remaining chocolate chips over the top. Bake in the preheated oven for 55-65 minutes or until the loaf is deep golden brown and a toothpick inserted near the center comes out clean. Cool loaf on a wire rack, allowing to cool completely before slicing. Store leftovers loosely covered at room temperature for the first day, then refrigerate after that. Enjoy! *You can use this recipe for homemade chocolate chunks - just chill the chocolate mixture in a parchment lined square pan until solid before cutting into chunks. omg this looks SO good. I’m just waiting for the day you write a cookbook, Michele! Made this morning – big mistake because the house is empty and I might EAT THE WHOLE LOAF. Hubs came home and said “Whoa, this is REALLY good banana bread.” Translation = he likes it more than the others I make 🙂 Thanks Michele! Oh I’m thrilled you guys enjoyed it! Definitely an addicting one! Thanks Michelle. I found Tapioca so used it. I used kiddie pans and cooked for 40mns at 180 deg Celsius. Top was hard but inside was good. Should I have cooked in 30 mns. Posting it now in insta & tagging u.
Hi! I just found your blog and I’m hooked. Made the banana bread today and it was amazing. My husband and kids had no idea it was healthier than the usual one I make. Can’t wait to make more. Wow that’s incredible to hear! Thrilled you all liked it! This recipe was amazing! i made it last night and it was a hit!!! definitely will be holding on to it. Oh I’m so happy you all enjoyed!! 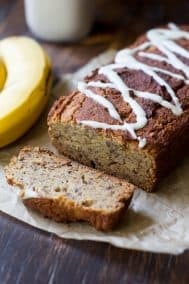 This is my new favorite banana bread recipe! I made it last night and my husband had eaten 3 slices before I went to bed! Thank you for sharing! Oh that’s awesome to hear! Have you ever used quinoa flour? Can you substitute it here? I’m not sure, haven’t used it. Hi. Can I substitute coconut sugar with palm sugar? Made this this morning- baked as muffins for ~20 minutes and added 1/4 cup ground flax. They’re so wonderful! The texture is perfect, so much like a traditional wheat flour muffin. They fluffed up beautifully and tasted delicious! Thank you! Sounds perfect, so happy you enjoyed them! Another WIN for the paleo running momma! I only had two medium bananas, and added 1/8 c flax and put into a liner muffin pan like Emily did above. So so good! Thanks for the great recipes! Michele- thanks so much for posting all these amazing recipes. My son has a gluten, dairy, and nut allergy and it’s nearly impossible for me to find anything he likes. I really want to beable to bake for him. Thanks to you, I have been able to do that! He has LOVED everyone of your recipes. I’m so grateful to you! This recipe is AMAZING!! I made a double batch and used half almond flour and half cashew flour because it’s what I had on hand. It tastes SO, SO delicious! My traditional banana bread recipe used 3/4 cup sugar per loaf and I can’t get over how sweet this bread is only using 1/4 cup of the coconut sugar per loaf. I plan to freeze my second loaf. I’m sure it will freeze beautifully! Thank you so much for crating and SHARING this recipe! So thrilled you enjoyed this! Made this bread last nite. It was delish! Silly question, it says dairy free but what about the chocolate chips? I always use Enjoy Life Dark Chocolate Morsels which are dairy and soy free – they’re linked to in the recipe if you want to try them out. Glad you enjoyed! Entire loaf… gone in less than 24 hours. It was definitely a huge hit with my 2 kiddos and my hubby (and I may or may not have had three slices when it was still hot from the oven)! So yummy! Made it exactly as directed. The almond butter was an awesome addition… thanks! This recipe is awesome. I’ve made it for my husband at least four times since I have stumbled upon it in the past months. Great job- we love it! This was delicious and I can’t wait to make again. I used chunky almond butter and that worked well. I’d give this recipe 10 stars if I could. It’s the first time I’ve made gluten free banana bread and it was best I’ve ever made. I’ll be making it a LOT! Thank you for creating/posting it! Tastes great! Will definitely make again! The only thing I’d note is that the batter was runny enough that the chocolate chips just fell to the bottom of the bread- even the ones I sprinkled on top. I’ve made this recipe and I absolutely love the flavor and texture. I was thinking of substituting that banana for pumpkin and adding pumpkin pie spice. Has anyone else tried this? How did it turn out? Great! Thank you for this recipe! You should stress the fact that the times vary and to monitor the bread as it bakes – if I hadn’t checked it would have totally burned and I saved it just in time. This recipe is perfection! The top got very brown but it didn’t taste burned at all. The texture is moist without being gummy. It’s perfectly sweet and the banana flavor really shines through. Next time I’ll experiment with flax eggs to see if I can make it vegan. Hey can I use all almond flour like I do with your zucchini choc. Chip muffins? I don’t use tapioca flour. We plan on making this today! Love your recipes! Wow! The best Paleo bread recipe! I tried it as muffins, made 11 of them. 27 minutes. Can coconut flour replace tapioca flour if I don’t have any on hand? Unfortunately no, it’s much more absorptive and dense. Is it supposed to be really wet inside? What brand of coconut sugar do you use? And where do you buy it from? Love this recipe by the way. This bread is so good! can i use gluten free all purpose flour instead? thank you!!! I used sunbutter instead of almond butter because it’s what I had on hand and it turned out amazing! Oh this is just a perfect combo of soft, fluffy & crunchy. I used crunchy almond butter & ground flax (in place of tapioca starch), a glug of maple syrup for coconut sugar & added cardamom. Texture reminiscent of a whole wheat based bread. This may even sway my Uber picky kiddos! Thanks for this!! Has anyone tried omitting the coconut sugar?Did it taste just as good without the added sugar? I never leave comments but something just had to be said about this recipe. It is different than any other paleo bread I’ve made…it’s perfect. The texture is almost the same as a traditional wheat flour bread. Most paleo breads come out dense and wet, but this little guy just kept on rising and came out light and soft. I substituted cashew butter for the almond butter, used regular chocolate chips because that’s all I had (not paleo I know), and doubled the salt because I love a good sweet and salty combo. It was simply amazing! Props to you!